Painted Dog Conservation UK is a UK-based charity which supports the Painted Dog Conservation (PDC) project in the field in Zimbabwe by raising funds and awareness in the UK. Its particular focus is on local education initiatives. 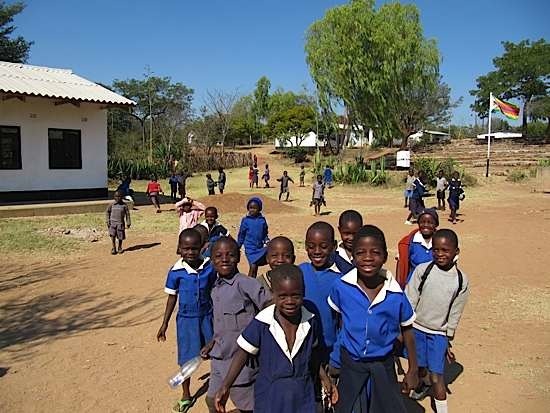 PDC UK offers speakers to talk to UK schools and other organisations about the work of PDC in Zimbabwe. 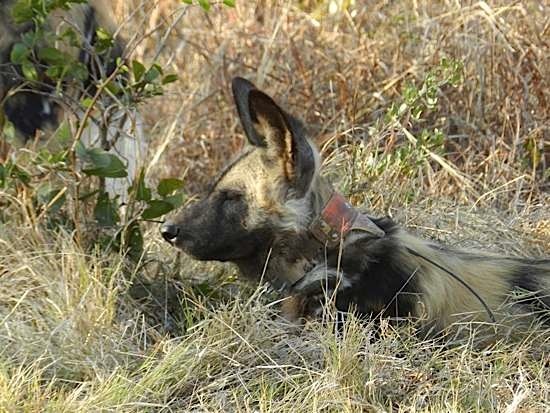 The Painted Dog Conservation’s (PDC) mission is to protect and increase the range and numbers of the painted dog (Lycaon pictus) both in Zimbabwe and elsewhere in Africa and PDC UK helps with this campaign. They are committed to creating a conservation model built on education, community involvement and international support. 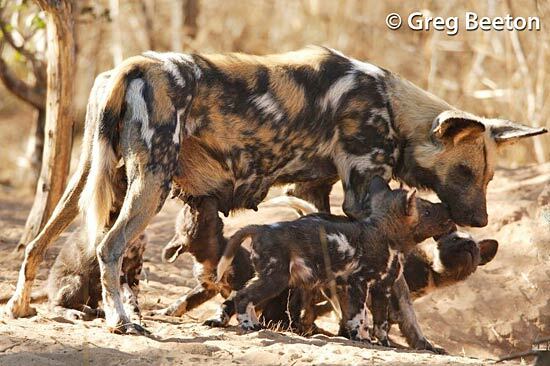 To ensure the painted dogs’ long-term survival, Painted Dog Conservation's conservation model includes the scientific community, the local community and the international community all working together. PDC UK is a registered charity which aims at raising awareness and funds to support PDC with its many programmes in Zimbabwe. The Patron of PDC UK is TV presenter Steve Leonard. Please make a donation to PDC UK via JustGiving, and if you are a UK tax payer your donation can also help give an extra boost through a Gift Aid Declaration. If you prefer to make a donation by post, please send your donation (cheques or Postal Orders in £ Sterling, please) to: PDC UK, GreyLourie, High Rd, Cookham Rise, Berkshire, UK SL6 9JS. Thank you. 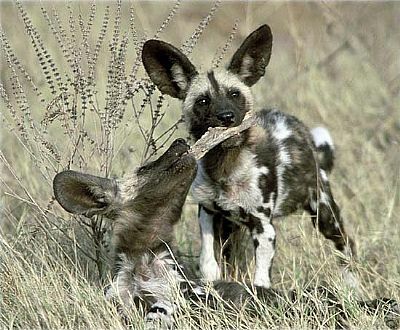 What your support could provide to the Painted Dog Project in Zimbabwe . 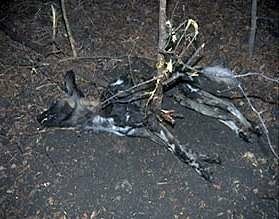 . .
A Painted Dog with litter. If lucky, one of these pups may survive. The others will probably die by shooting, snaring or poison. These anti-snare collars are effective in reducing the number of dogs killed slowly and painfully by illegal snares, but cost over £200 to buy and fit for each dog. Your donations can help. 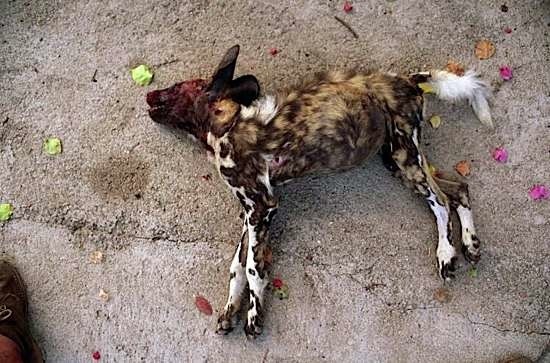 More and more painted dogs are shot by farmers as expanding human settlements encroach on dog's traditional hunting territories. The PDC Outreach Team from Painted Dog Project (PDC) has worked hard with the local community to improve food production and education. 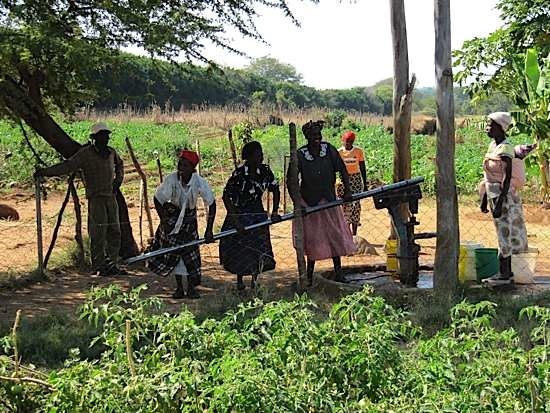 PDC has helped with funding for a water pump to save the long trek to a waterhole and help improve irrigation. 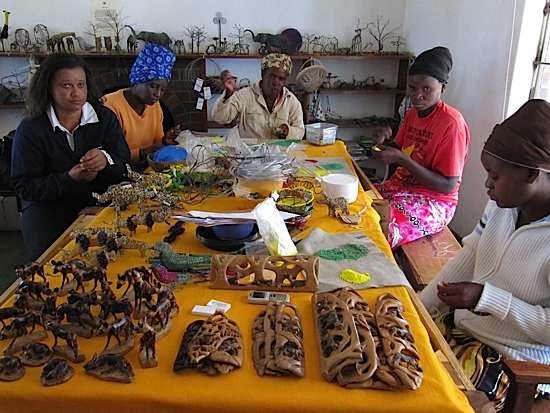 Painted Dog Conservation initiated this community development project in 2003, beginning on a small scale, by identifying, encouraging and training the talent in the area to create art and crafts for the national and international markets.